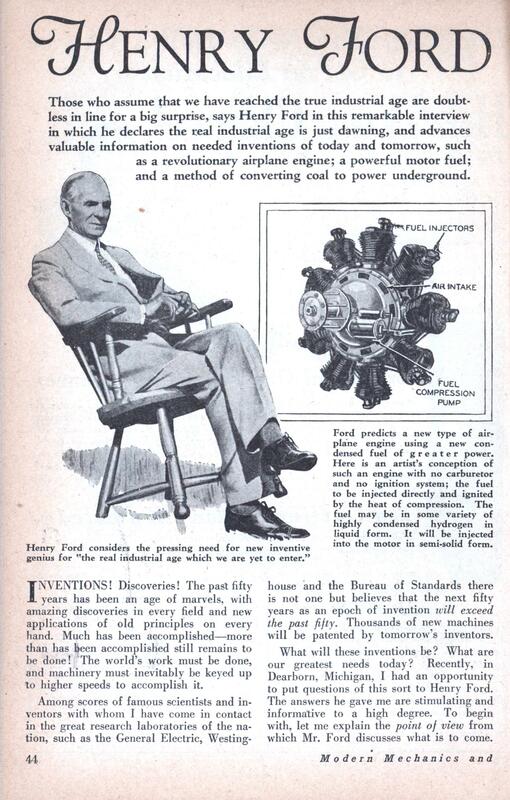 Those who assume that we have reached the true industrial age are doubtless in line for a big surprise, says Henry Ford in this remarkable interview in which he declares the real industrial age is just dawning, and advances valuable information on needed inventions of today and tomorrow, such as a revolutionary airplane engine; a powerful motor fuel; and a method of converting coal to power underground. INVENTIONS! Discoveries! The past fifty years has been an age of marvels, with amazing discoveries in every field and new applications of old principles on every hand. Much has been accomplished—more than has been accomplished still remains to be done! The world’s work must be done, and machinery must inevitably be keyed up to higher speeds to accomplish it. Among scores of famous scientists and inventors with whom I have come in contact in the great research laboratories of the nation, such as the General Electric, Westing- house and the Bureau of Standards there is not one but believes that the next fifty years as an epoch of invention will exceed the past fifty. Thousands of new machines will be patented by tomorrow’s inventors. What will these inventions be? What are our greatest needs today? Recently, in Dearborn, Michigan, I had an opportunity to put questions of this sort to Henry Ford. The answers he gave me are stimulating and informative to a high degree. To begin with, let me explain the point of view from which Mr. Ford discusses what is to come. “We already live in a comfortable age,” he said, “but it is not as comfortable as it is going to be. We have made a beginning. Many things remain to be done. “It is sometimes said in criticism that ours is a machine age. It certainly is. But those who imply that men have been made machines and that life has been mechanized, are reactionary in their thinking. The machine appears only through man’s mastery of it. It has been invented and adopted and used by men, first, to save the dignity of their homes by centralizing work in factories, and second, to save time. “Those who assume that we have now reached the true industrial age are doubtless in line for a surprise. “Just what inventions would you say we are most in need of today to further this ideal industrial age?” I asked. Let me say at once that Mr. Ford did not answer this question directly. Rather, he pointed out the needs of today and tomorrow by discussing the opportunities for inventiveness which confront our generation, our geniuses and all who are of an inventive turn of mind; and he spoke as though much might be expected from the young mind, the unconventional mind. “Just what do you mean by that?” I asked. “Boys who are thinking about airplanes now do so without even knowing what kind of engine the airplane ought to have. It reminds me of the time when I was starting in. I was then thinking in terms of steam because steam was in use in locomotives. It was only after much experimenting that I turned to the gas engine. 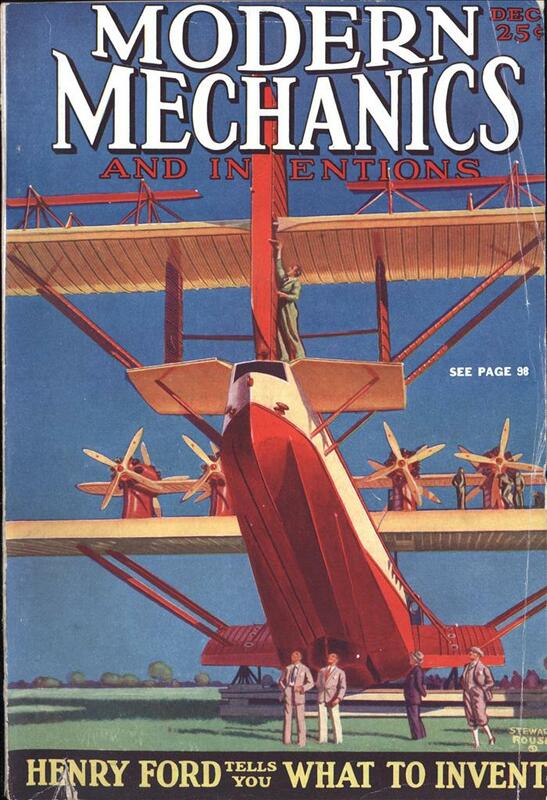 It’s perfectly natural that boys should think that airplanes must be run with gas engines. They think so because automobiles are run by gas engines. But some day a boy will come along who will discover that gas engines are not the thing at all. “What we now call airplane engines are really automobile engines in all their fundamental principles. Some of our experi- ments here at Dearborn may help discover what an airplane engine should be like. At present, we are giving our attention to the Diesel engine. The outlook is fairly promising. When Mr. Ford speaks of the fuel of the future he thinks of something with “gip” in it — and four or five times the “gip” that is in our present day fuel. What will this fuel be? Whence will it come? He foresees no shortage of fuel for our internal combustion engines in the future. And it remains for some one to find how this fuel can be produced commercially— better fuel at a cheaper price than that we now know! “In all probability,” said Mr. Ford, “American cities will in the future be heated by electricity. This means that our houses must be built different—better! We must find out how they can best be insulated. Then they will be cooler in summer and more evenly heated in winter. “Remember,” he cautioned, “that individually men invent but little. We accomplish most by combining in new ways, principles and devices previously discovered. What has already been done is not necessarily the best that can be done. From where we are, we are going ahead. Many changes are just around the corner. Think of the waste in time, money and effort involved in cooking in thousands of different homes in a single community! Let a young man turn his attention to inventing a kind of kitchen that can feed a hundred people! The day is coming when cooking will no longer be done for individual families. What kind of a kitchen it will be that will take this drudgery out of the home, and how the work should be done, remains for somebody to find out. In years to come we shall undoubtedly use rubber for floors and thousands of other purposes for which we do not even consider it today. In Switzerland, it is now being used for roads. In America, we have progressed from dirt, wood, stone, tar, and macadam to cement roads. Will the roads of the future be built of rubber? That question is worth thinking about. “We need a much greater rubber supply. Here Mr. Ford told me a story with a moral. As you will see, the moral has to do with the method of the inventor. If you were starting out today to invent something, what is the first thing you should do? I quote Mr. Ford in answer: “Back in 1884, I was agent for the Westing-house company, and did repairs for them. 1 was asked to fix something on a portable steam engine. It was a Mills engine— built by Emory W. Mills, a master mechanic of the 19th century. I ran it all that day, and never had occasion to operate another like it until a short time ago. “Recently, at Malone, New York, when we were searching the country over for old engines that will help boys visualize America’s mechanical progress, we came across one of those built by Mills. We acquired the parts and the engine is now as good as ever. I doubt if there is another in the country. Very few of them were made before the death of Mills put a stop to production. “Mills was a genius fifty years ahead of his time. He put into that old machine many of the things that are found in the most advanced steam engines of today. He had the superheater idea a quarter of a century before it was applied to locomotives. No other steam portable engine has ever equalled it for efficiency. “Of course, the demand for such an engine has been outgrown today, by reason of the use of other motive power for portable engines. If, however, a man, for some reason, had occasion to develop a portable steam engine for use today, his job would be greatly facilitated, and his imagination stimulated, if he first found out how Mills handled the problem. I can remember when, early in my experience as a newspaper reporter, Thomas A. Edison talked with me about inventions and needs of the day much as Mr. Ford did recently. In one respect these two men take an identical attitude when discussing this subject. Both refuse to be didactic and to name the one thing of which the world i3 most in need. The simple truth of the matter is that there are too many needs today for any one to be said to over-top all the rest. And yet, my impression is that with regard to what this one greatest need is both having something in particular in mind— and that has to do with the development of full automatic machines. Hear what Mr. Edison has to say on this subject. “Machines of a semi-automatic character have given us most of the great conveniences of our new industrial age, including the eight-hour day. The time has come when we are ready for the full automatic machine, which is in use PATTERN CONTROL And he speaks of the principle of the Jacquard loom, a great mechanical principle as yet limited in application mainly to the manufacture of silk and to the player piano. This he calls the great “reserve” principle of the future —”the principle which brings into action the various parts of a machine in accordance with a perforated pattern traced on a steel card or as on the paper roll of a player piano.” As a means of control this principle can be applied to any machine. “The full-automatic machines now in use give us an indication of some of the savings that we may expect,” says Mr. Edison. “Full-automatic machines are now making screws and all kinds of small parts. These machines require very little attention, if any at all, one man being sufficient to attend a dozen of them. Hence, the costs of screws and small parts are very low. Mr. Edison sees no reason why any handwork should be necessary in the manufacture of a garment. Why should not a machine be designed to take in cloth at one end and drop out the finished coat or trousers at the other? Old tires are often recycled into asphalt for road building. So, the “new kind of engine” turned out to be the jet. Slower moving parts? Nope. Balance? yep. Reliablity? yup. Uses a fuel with 4x the energy of gasoline? No, but maybe 1.5 times as much in some cases. 2.5/4 is 62.5% – a pass. Yeah… Let’s listen to an auto manufacturer talk about airplanes! Hey, there was a very successful airplane called the Ford Trimotor; there are examples still flying today. Well the MD may have an undergraduate degree in engineering. That is not as odd as it seems; both are very science intensive studies. I knew of an Air Force test pilot whose undergraduate was engineering, followed by a MD; after that he went into Air Force pilot training, etc. Many astronauts have precisely that experience. I seem to recall there were a couple of bicycle repairmen that had some ideas about airplanes about the same time Ford began producing automobiles. > he foresees no shortage of fuel for our internal combustion engines in the future.